» “Toxics” in the water: What to do? “Toxics” in the water: What to do? 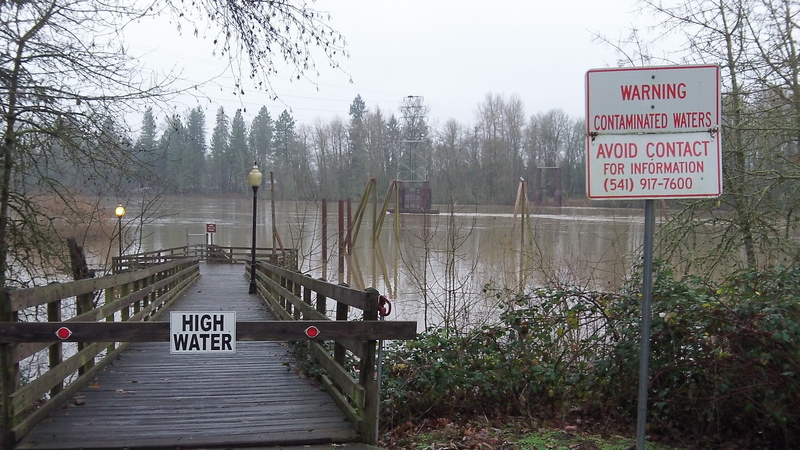 High water in the Willamette River last December with the usual warning about sewage overflow. The Oregon Department of Environmental Quality has released the results of a seven-year study of “toxic chemicals” in the state’s waterways. Too bad the report is not as useful as one would wish. The report came out on April 13. It said that “toxic chemicals ranging from pesticides to metals are present in all waters of the state, with some monitoring sites showing levels above state criteria or benchmarks for human health and aquatic life.” That sounds alarming. The details are less so. A chart in the report says the largest number of chemicals, 46, was found in the streams of the Willamette River Basin, which is no surprise considering that the valley contains about two-thirds of Oregon’s population. Pesticides in current use made up the largest share of the substances found in the Willamette, also no surprise considering the huge amount of farm land in the valley, along with all those suburban lawns whose owners try to keep them more or less free of weeds. Also in the Willamette, Industrial chemicals made up only a tiny fraction of the total. (The chart makes it look like two out of the 46 chemicals found were of industrial origin.) About eight or nine came from consumer products including medications. The DEQ will use this chemical assessment, which began in 2008, as a base line for further studies. The agency says one goal of the monitoring is to “present and make available information gathered for public benefit.” But the public can’t draw any conclusions from the report so far. What if anything can or should we do, for example, to prevent traces if acetaminophen and codeine from reaching our rivers? If you take the pills — and if you have a toothache you don’t have much choice — how do you prevent the residue from coming out and going down the drain? You might be able to do with less or no household cleaners containing certain solvents, but the contents of medication are out of your control. New baseline? Moving the bar higher? I’ve spent far more time in the Willamette back in the 70’s and 80’s than most people (water skiing, etc) and am no worse for it as far as I know. They had standards then too. What a bunch of hooey. Obviously our detection methods are more sophisticated now compared to then but at what level does harm occur? And after all the clean up over the past 40 plus years are more laws and regs going to make that much difference. Ever hear of “diminishing returns”? Economies of scale? The government won’t be happy until pure spring water flows by town. Job security for government agencies. More regulation….just what we need!